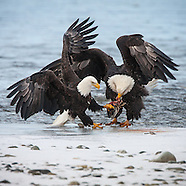 Every fall thousands of bald eagles congregate in southeast Alaska to fight over the salmon before the Chilkat River freezes over. Roaming ranches that can span thousands of acres, men and women still spend their work days in the saddle. Family owned and operated for generations, farms large and small across the western United States are still very much a hands-on endeavor.